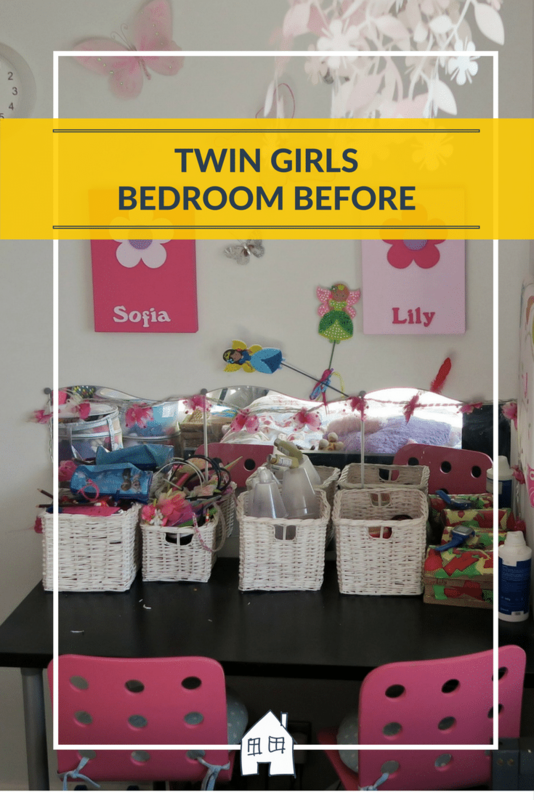 About 2.5 years ago we renovated our twin girls bedroom, from a flowerly old fashioned bedroom to a clean and fresh bedroom for them. 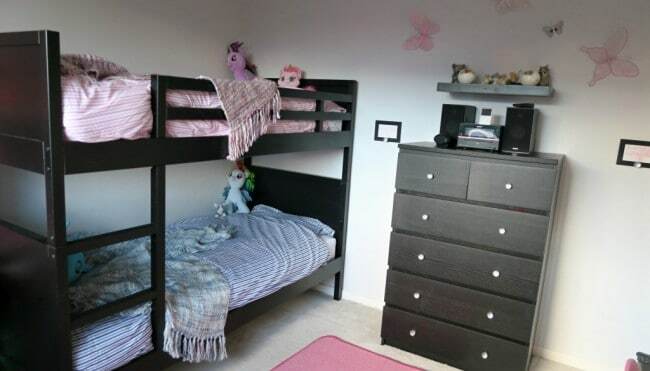 We decided to put them in bunk beds, as this would free up the space in the room. Well fast forward, and they hate being in bunk beds! 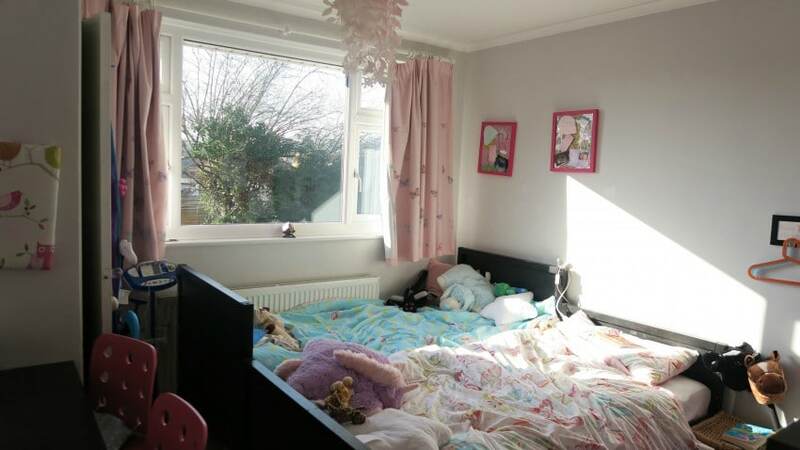 We can’t afford to move house, or extend the house to make another bedroom. We’ve tried moving the room around, taking the bunks apart and adding more storage but it isn’t working. Their beds are currently next to each other, which has it plus points and it’s downsides! I love being able to lay down on their beds and read to them, and not squeezing underneath the bunk! But they chit chat at bedtime even more than before, and also wake each other up earlier in the morning. 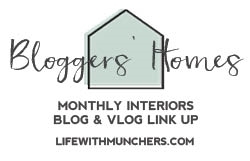 So we’ve put our thinking caps on, taking to Pinterest for inspiration and Ikea looking for ideas. It’s a very simple layout, and I wish we did this in the first place! However if you look at this picture below you will notice we currently have a built in cupboard. This is where the old water tank was housed, we have used it for storing board games and hanging their uniform. We have always worked around it, but by removing it, we are able to push the bed into that corner. This will free up so much room, and give this room the space that is needed. We are then able to have both beds on either side of the room, creating a perfect space to be able to call their own. Which brings me around to the colours. 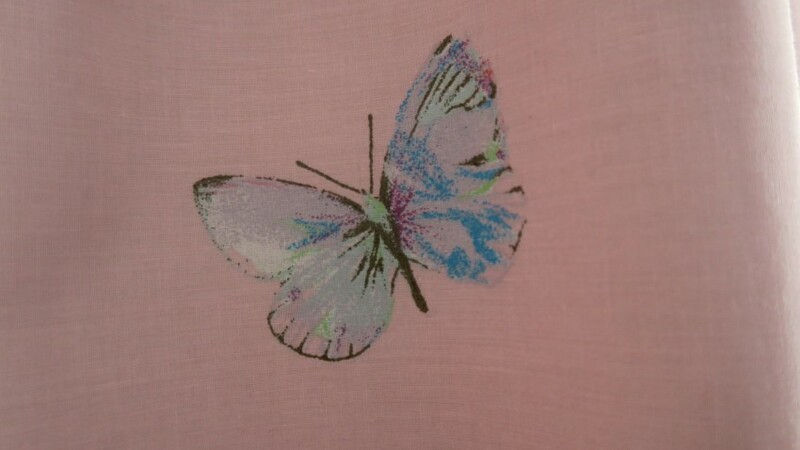 I am keeping the pink butterfly curtains, and pulling in the colours from this. 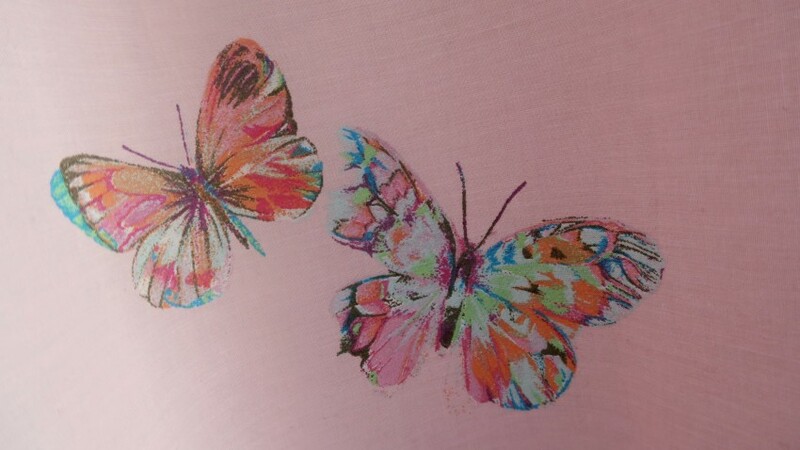 Which suits my twins perfectly, one wants pink and one wants blue! However having the layout like this, it means I can create a ‘zone’ for them. 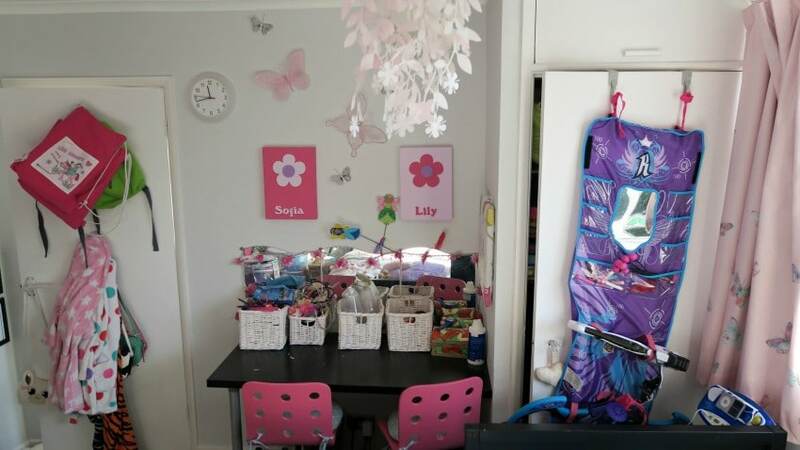 A side of the room that is just theirs, and have their own colours and own items each side of the room. 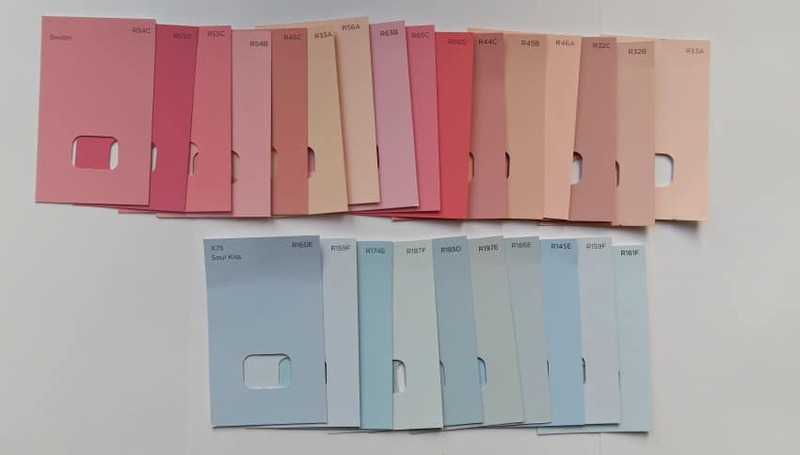 Although after a trip to the Valspar counter today, I am not sure how I am going to choose from all these different tones of blue and pink! Let alone the neutral colour too. 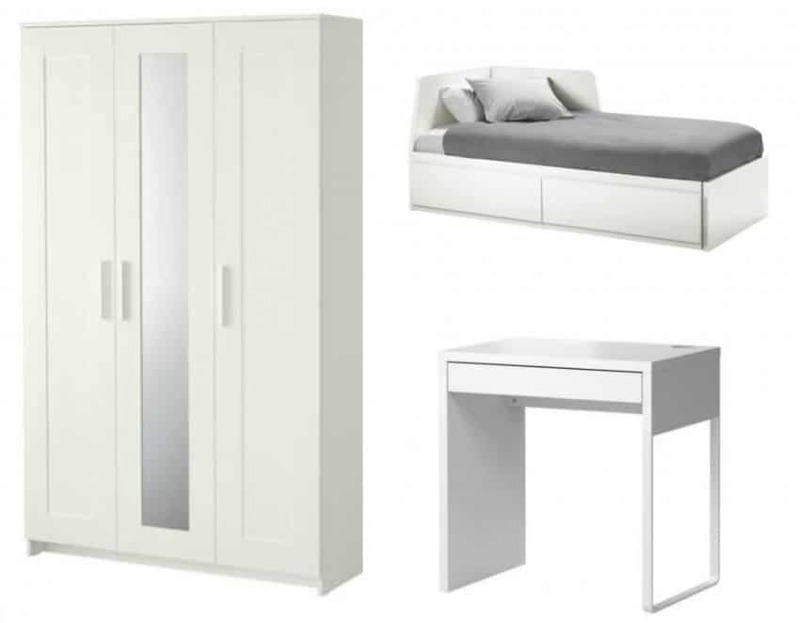 We took a trip to IKEA to purchase the furniture for their room, I wanted to go with all white for their room this time, and have picked out some great pieces. The beds had to be multi functional, I need them to be able to sleep them of course! Include storage underneath, and also to have additional sleeping. Hubbys Mum comes to stay with us, but it has always meant one of the twins has had to sleep on an air bed, or go top to tail with their Sister. Which then causes issues with kicking each other in the night! So we found a great day bed called Flekke , including a backrest for sitting up and reading. I want to get some squishy cushions for them to snuggle up in the corner with, and use it as a reading area too. The wardrobes are triple, we have purchased two sets to gain lots of storage. They have a hanging rail on one side, with a shelf above. Hubby is also going to try to add an extra shelf near the bottom too. 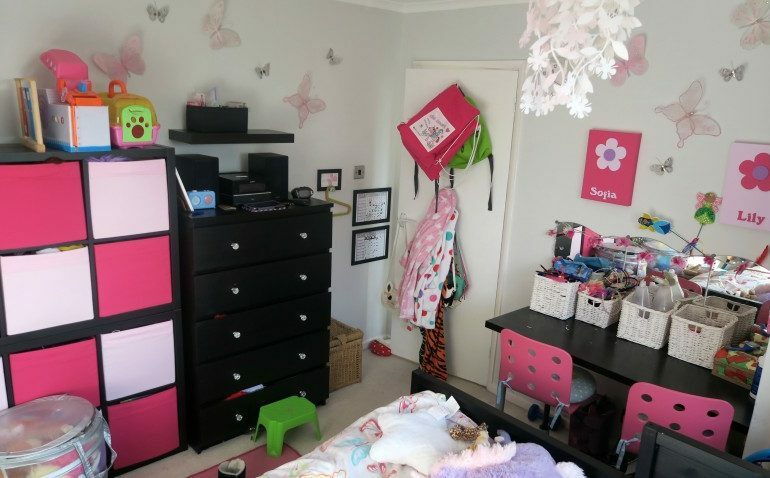 We store all the kids toys in their bedrooms, so always need toy storage. So we put together this storage system, which has been great and stores so many toys, however they need to shrink them a bit! Although that is me struggling to get rid of some of the toys. The triple wardrobes have a single door area, they have 4 shelves inside. 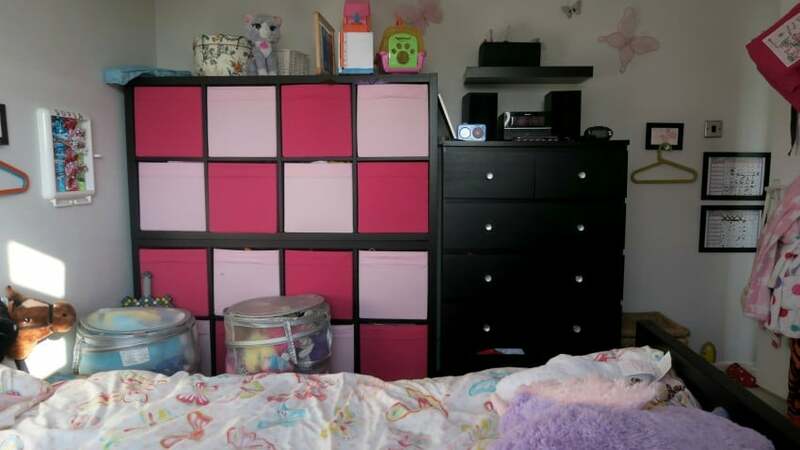 So I am going to insert 4 of their pink toy boxes each to store all their toys away…..that should be hard!! Also they currently have a desk they share, they use their desk so much. So I have included 2 new desks, which will sit in between their new beds. 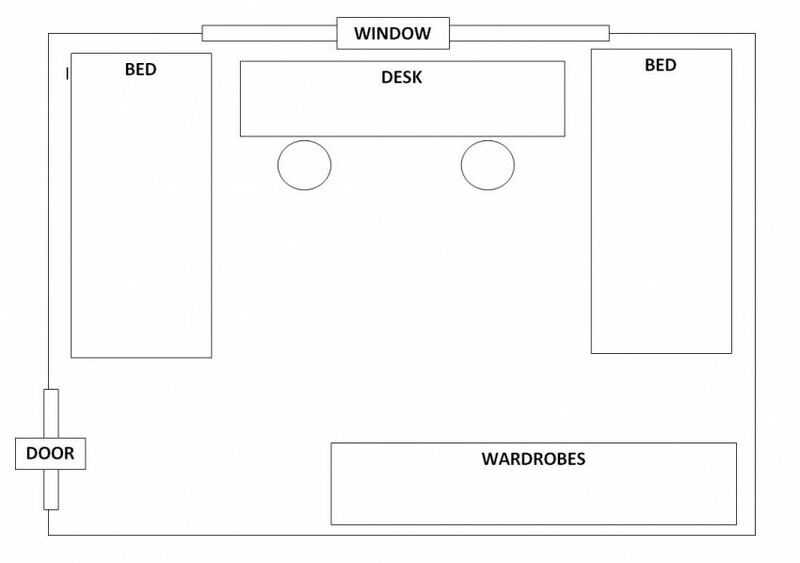 I have gone for two, rather than one big one because it gave them as much room as possible, filled the gap, and also it meant when we have one person sleeping over we can easily remove one desk for when they additional bed gets pulled out. I will also use these desks as little bedside tables. So that’s our plans, I cannot wait to get started and they are bursting to have it all done too. I am currently sat here waiting for the HUGE IKEA delivery that is arriving between 2-9pm! I was super pleased to make the most of their free delivery when you spent over £350 on bedroom furniture offer that is currently running, it saved our poor car from carrying all that furniture. TOP TIP: Also make sure you’re a IKEA family member, and check your offers when you go in store on the computer. As we picked up a £60 off voucher too. Ah that is pretty cool! Good idea, not sure I could make it work along that outside wall….I will have a think! Great idea and I think that layout will work brilliant. I love organising little DIY projects but I have a lot of other stuff to do before that. Good plan, I look forward to seeing the results! 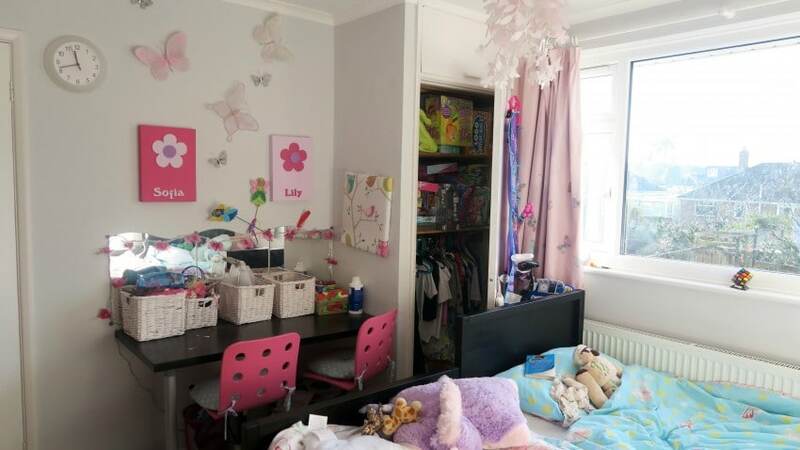 This sounds so similar to the dilemma we had with my youngest daughters room. It’s tiny, and we had a built in wardrobe and lots of the same issues. 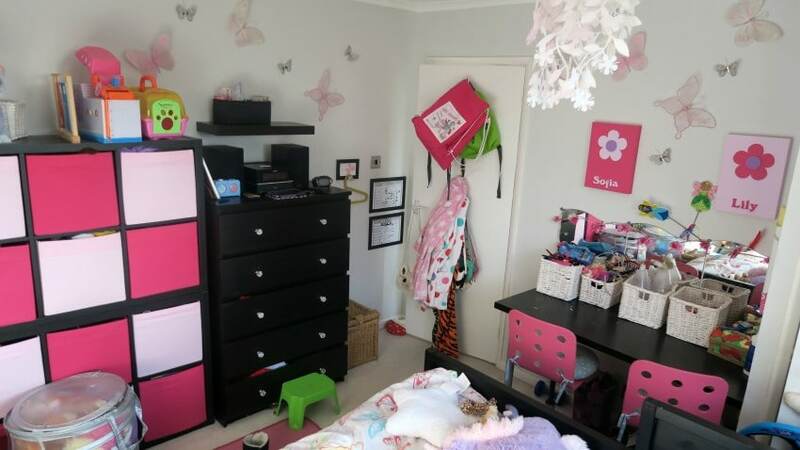 We even bought the wardrobe and bed from Ikea with storage, and a spare pull out bed. It was the best descion we made, and works so well. We did have to be ruthless with the toy cull though. What exciting plans I’m looking forward to seeing how it turns out I love looking at other people’s kids rooms for inspiration. Wow what exciting plans. We have three sharing a room and that’s quite tricky. Wow great plan, the white furniture will make the room feel bigger too. As a sibling who always shared I love how they will now have such defined spaces. Suggestion hang storage too, that has really helped in our kids shared rooms.